If you are a school or organization that needs templates to use on an ongoing basis, then MakeSigns can provide you with custom templates for all students and faculty to download for free. They can be custom tailored to your school or organization, complete with all your official logos, colors, and other branding elements. You will have the opportunity to see proofs of the designs and make changes before they’re made available to download. To get started, let us know the name of your school or organization and if you need templates for an upcoming conference or group presentation. We’ll get back to you as soon as we can to get all the information we need. 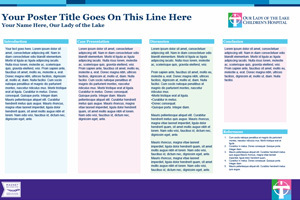 Templates are usually made available online within 1-2 weeks. You'll receive a confirmation email once we review your request.